A few weeks ago I did a top 10 for premium VSTs, and although those are all excellent plugins that you should definitely take a look at, sometimes you just want to have quick access to interesting freeware that could serve as worthy additions to your collection of sounds and tools. And while the amount of great premium VSTs is practically incalculable, the amount of free ones is even more massive; on top of that, so many of them aren’t even worth trying out that it’s easy to become discouraged during your search. You’re likely to come across websites full of free VSTs that don’t supply you with anything useful, and that can be frustrating. But I’ve done my share of roaming the wilderness of cyberspace, and in my ventures I’ve come across quite a few that are actually quite practical, some of which even rival the quality of the premium stock. So in this article, I’m going to list 10 of the best free VSTs I’ve come across. Whereas my top 10 premium list was ranked, this one is in no particular order. I don’t have any particular favorites, but of all the free plugins I’ve tried out in the past few years, these are the ones I’d certainly recommend. This is a great VST because it emulates six different instruments, one of which is the tabla, an excellent addition to the percussion section of your collection of sounds. The sitar is an instrument that fits so well in so many styles of music, adding a vibrant, trippy texture that can paint swirling melodies which fit well with anything from hip hop to trance to new age. It’s always good to have some tabla and sitar sounds, and if you don’t have any yet, you might want to take a look at this plugin. Aside from tabla and sitar, you’ll get sounds from other Indian instruments like sarod, veena, tar, and tampura. All of these instruments are interesting and versatile; if you don’t know what some of them sound like, take a look at this video to hear them. However, Indian instrumentation isn’t for everyone, and that’s understandable. If it’s not what you’re looking for, DSK has you covered with a multitude of other instruments, too, including full orchestras, strings, acoustic guitar, and more. Head over to their website and take a look at everything they have to offer. There could be something else that suits your needs. 2. Piano One – Another great analog instrument emulator, Piano One provides the sound of a Yamaha C7 concert grand, a powerhouse that has been favored by professionals for decades. This is easily the best free piano emulator available – but don’t take my word for it, check out this video to hear what it sounds like. Sometimes piano samples just don’t have that organic quality that real pianos boast, and you want all the extra little subtleties that make the real piano sound the way it does. This is the closest you can truly get to that natural sound without using a natural piano. At least, in terms of freeware. Note: this plugin isn’t currently available for download from Sound Magic’s website because they’re working on version 2. You can download the original plugin here. 3. UpStereo – Do you ever feel like your mixes aren’t loud or strong enough? Do they sound kind of weak and brittle in comparison to the music you admire? You should give UpStereo a shot, in that case. This is a plugin that will help you make fuller, richer mixes, and it does so with a relatively simple (and cool-looking) interface. 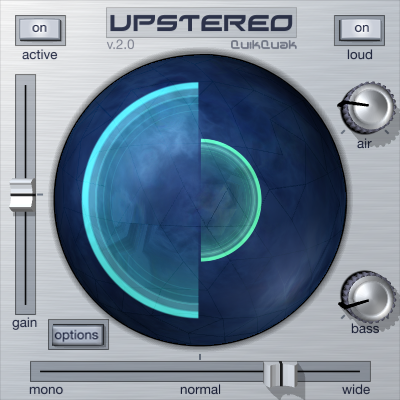 UpStereo has three main functions: A fixed-frequency EQ, a stereo width unit, and a “loud” switch. The EQ will help boost your high and low frequencies. The stereo width unit will make your loops sound fatter and take up more room in the mix – great for bass sounds that need more punch to them, or for other sounds that take up too much room and need less presence. The “loud” switch will amplify your mix on a smooth curve, to ensure that it’s boosting the volume levels while keeping clipping to a minimum. When the sound begins to clip, the colorful, circular part of the interface will turn red, so it’s easy to tell when you’re overdoing it. This is a useful tool to play with, especially if you’re not too experienced with mixing. 4. Aalto Solo – At first it was the interface that drew me to it – the layout and color scheme reminded me of Massive, which I adore – but it’s the impressive manipulation and warping power that really piqued my curiosity. This is just as much fun as Massive, even if the sound variety and quality aren’t as remarkable, it does offer a lot of the same functionality. There are so many waveform parameters to tweak, all kinds of effects and many presets to enjoy, it’s guaranteed to provide you with hours of fun and plenty of useful sounds to add into your music. This is one of my favorite plugins in general, and I highly recommend that you give it a try. See it in action here. Note: While this plugin is not free from the manufacturer’s website, if you head over to this page and register (it’s free), then you can download the software for free. 5. Firebird 2 – In a scene saturated with synth plugins that all seem to do the same thing, Firebird towers above them all. This is just an all-around wonderful softsynth, and the fact that it’s free seems almost criminal; at least, it seems that way before you find out that it was just recently made free, and was a premium plugin for seven years before that. This excellent synth comes with a whopping 437 sounds to play with, a very simple and manageable interface that won’t be hard to get the hang of, 84 kinds of oscillators and 38 kinds of filters. Take a look at Firebird in action, and if you really like it, there’s a premium version and a selection of extra sounds you can purchase that make it even more useful. 6. Basic 64 – If you’re into those old school electronic sounds, like the ones used for systems like the Commodore 64 and NES, then you’ll love this plugin. Great for blip-hop and chiptune tracks, Basic 64 is based on the original SID chip sound from the Commodore 64, although it’s not an exact emulation. Still, it’s a lot of fun, and it has a huge range of applications. 7. Glitch – While you do have to pay for the new plugin, Glitch 2, the first one is also really cool and facilitates the warping, mutilation and shattering of your beats and recordings. If you like messing with your tracks and want an intuitive, fun and colorful interface to use while chopping them up and scattering the bits, this is definitely a plugin to look into. Tampering with your beats just got a whole lot more fun with Glitch. It’s no wonder it’s gotten so much praise; for a free plugin, it’s extremely versatile. 8. EXD-80 – This list wouldn’t be complete without a couple of drum plugins. This plugin from Third Harmonic Studios doesn’t utilize any samples, so it’s considered a drum synthesizer rather than a machine, yet it’s still capable of pumping out an array of different sounds from more basic hits to bizarre squelches and throbs. If you want the functions of a softsynth for your drum section, look no further than the EXD-80, because it’ll help you generate some very creative loops. 9. TS-808 – What with the rise in popularity of trap music in the past few years, it’s always handy to have a good Roland 808 emulator in your audio arsenal to get those sub kicks and crisp claps that define the style. This is as close to replicating the 808’s sound as you can get, and as freeware it’s certain to come in handy. 10. TAL NoiseMaker – This is a simple synth that doesn’t offer all that much in the way of originality, but it has very good sound quality for the waves it can produce. Aside from the usual suspects when it comes to softsynth tweaking (filters, effects, oscillators, etc), it has an interesting Detune feature that randomly changes the tune of the notes you play, which can create an odd, dissonant texture that fits nicely with noisier styles. Togu Audio Line offer a lot of different freeware plugins that have different features, all of which are worth tampering with. That’s my top 10 for now. I hope there was some stuff here that you can use for your own work. I’m frequently on the prowl for new plugins, so there will be other lists to come. What are some of your favorite freeware VSTs? Let me know in the comments.